Back in July, my oldest daughter Amanda and I took our first ride to the rock. It was my first extended bike ride in years, and, quite frankly, I was just happy to survive. We subsequently took a few more rides over the summer before she headed back to college in the fall. When she came home for winter break, she asked if I wanted to take another ride out to the rock. I figured, why not? So we took our second ride out to the rock this past Christmas Eve. Shortly after we left the house, Amanda remembered that Pacific Coast Highway was closed south of the Point Mugu Naval Air Station due to the rock slides from the storms that hit the area during the first half of December. Due to the slides, we weren’t able to make it all the way to the rock unfortunately, but we still rode to the base. As with our first ride in July, the way out went much better than the way back. We averaged well over 14 mph on the way out to the base, but we struggled to maintain 12 mph on the way back. 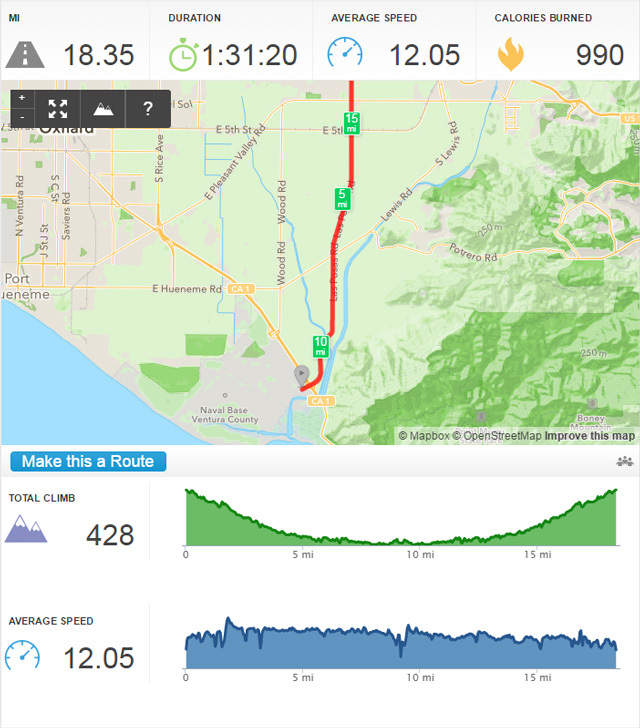 After reviewing the ride profile (see below), I had forgotten that the ride out is slightly downhill the entire way and subsequently uphill on the way back. I thought it was due to the wind, but now I’m thinking it’s more likely the elevation change. Anyway, our overall average was 12 mph, which was below our 12.5 mph pace over the summer. I don’t know if it was the cold weather, wind, the holidays, being lazy, age, or some combination of all the above that slowed us down. Either way, it was still a fun ride, and I’m hoping we will get one more ride in before she heads back to school at the end of the week. Here’s this ride’s profile and splits. The ride was a bit over 5 miles shorter since we couldn’t get to “The Rock”. Otherwise, the route was identical. This entry was posted in Life Journal and tagged Bike Rides on December 30, 2014 by Gregg Borodaty.